Houses being built in Weymouth in South Auckland. Photo by Bernard Hickey for Hive News. 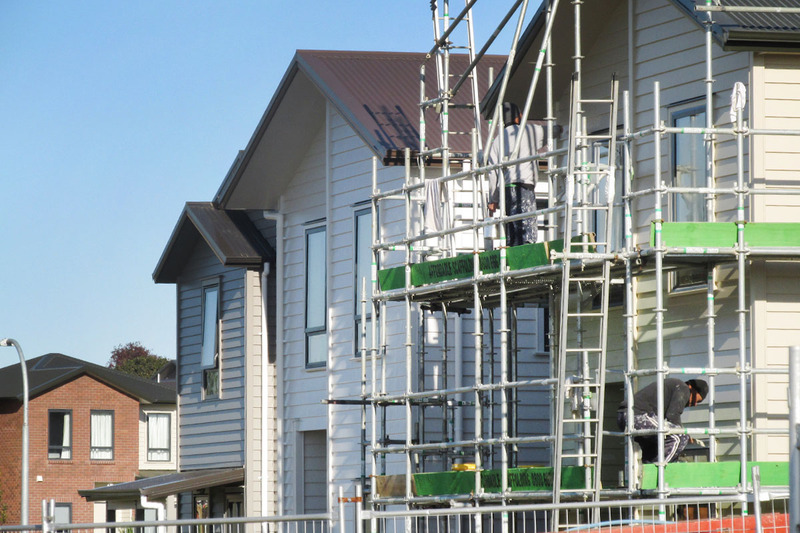 Housing Minister Nick Smith and Auckland Mayor Len Brown have announced the creation of two new greenfield Special Housing Areas in South Auckland for up to 1,800 new homes, appearing to end a suspension on the issuing of new consents for SHAs in greenfields areas in Auckland. Deputy Mayor Penny Hulse said in May that approvals for consents for three SHAs at Huapai in north west Auckland had been deferred while the Council discussed infrastructure funding with the central Government. She said then that Council would prefer SHAs in future to be in brownfield areas to avoid costly new infrastrucure. See my column on this from early May. The move was seen as Auckland suspending new greenfields SHAs while it clarified funding of transport and water infrastructure. Smith and Brown announced the creation of two new SHAs in a media event in South Auckland on Friday. “These two latest Special Housing Areas at Glenbrook and Drury in Franklin now bring the total number of Special Housing Areas in Auckland to 86, with a combined potential yield of up to 45,000 new homes," Smith said. "I am particularly encouraged that Auckland Council is continuing to advance greenfield sites for Special Housing Area status. This is welcome progress, in both scale and momentum, to help address Auckland’s issues of housing supply and affordability,” Smith said. The two new SHAs were at McLarin Road at Glenbrook, with 87 hectares for 800 homes, and at Bremner Road at Drury, with 68 hectares for at least 1000 homes. “Both of the new sites are already closely located to amenities such as local halls, reserves and education centres, and we are confident that the proposed housing developments at these sites can be well-serviced by existing or planned water, waste and roading infrastructure,” Brown said. “I also commend the undertaking from the developer to build at least 150 affordable homes at Bremner Road – or 15 per cent of the total project. This is above the 10 per cent affordable housing provision which is required in the Special Housing Area by the council," he said. Brown said the council would be considering additional SHAs over the next few weeks and hoped to recommend more locations to the Minister in coming months. Smith and Brown also announced a 5.2-hectare extension to an existing 29-hectare SHA at Fred Taylor Drive in Massey. Smith later told Interest.co.nz there had never been a suspension of consents for new greenfields SHAs, but that decisions were being made on a 'case by case' basis. He said he remained hopeful that the areas in North West Auckland could be approved in future and the Government was working with the Council on others. Auckland Council Manager of Growth and Infrastructure David Clelland said there had never been a moratorium on the approval of new SHAs. "The council simply deferred decisions on some SHA requests and indicated a strong preference for brownfield SHAs pending progress on infrastructure discussions with central government," Clelland said. "The council also said that with the expected release of a draft Future Urban Land Supply Strategy (FULSS), that would be a key factor in determining future greenfield SHAs. The council has a number of greenfield SHA requests under consideration and we continue to talk to these applicants," he said. "Once the further SHA decisions the Mayor referred to are assessed later this month (all brownfield), we will be reviewing and reconsidering the existing greenfield SHA requests in light of the content of the draft FULSS, and any other relevant matters." Green Party Co-Leader Metiria Turei said the new greenfield SHAs would condemn thousands of Aucklanders to "a life of transport poverty." "Because this Government is obsessed with building motorways and with pushing Auckland’s city limits further and further out, the people who live in these houses will be forced to spend hundreds of dollars a week just to drive to and from work," she said. “And it’s not just going to hit individuals at the petrol pump; we know that having Aucklanders sitting in traffic jams is terrible for the country’s economic productivity, the environment, and for people’s health and quality of life." Likely to have a focus on ability to service debt. The paradigm shifted quite some time ago. Last time I went out there (15 years ago) it took an hour and a half on a Sunday afternoon from Ponsonby. No one sensible would choose to commute that distance to work in Central Auckland. Auckland is full, this sort of sprawl is just insanity. I'm with you on that one. These SHAs are no better than a very bad joke for anyone stupid enough to buy into the insanity. If you were going to work in Hamilton you would be best to live in Hamilton, not 110km away. Even suggesting that makes me wonder if you understand anything about the problem. Glenbrook is a good place to live if you work at NZ steel. It may be not bad if you work in Pukekohe or Manakau, but it is no solution for people who work in Central Auckland, which is the problem. What, 30 minutes to Manukau Central, not to mention all the evolving employment near the airport? The infection will quickly spread to Barfoot's auction room and in an instant we are talking about price falls. I've already noticed several properties knocking $100k off the asking price trying to attract interest over the past few weeks. or as ppl rush out of the chinese stock market they'll want to put it somewhere else. Your comment on the $100k is however an eye opener. yeah that's the way I see it Steven...the greater security of 'bricks and mortar"
Thomas, stock market bubbles are like Ponzi schemes. Money can only be taken out of a stock market if someone else puts money in. Of course with leveraging there may be no money to actually take out. Say 3 weeks ago you had $100,000 to put into the Chinese stock market. So to boost returns you decided to leverage it to invest $300,000 in shares. Now today you decide to sell (or more likely got a margin call). Someone else pays $200,000 for those shares and you are left with zip. Nothing left to invest in bricks and mortar. The same thing happens in any crash. It is coming. And soon. Good point Chris. question - do you think this could not only lead to less interest moving forward in buying Auckland property, but also (and perhaps more importantly) see the dumping of a lot of Auckland property with potential bubble popping implications? All the money made in the 150% ramp up in Chinese stock prices over the past 15 months or so went somewhere. The smart money was obviously converting gains to hard assets rather than reinvesting in stocks. Some of that money obviously leaked into the Auckland (and Sydney/Melbourne markets) over the past year causing a fair amount of the rapid escalation in Auckland prices. The reality is that in ChCh and other NZ centres there is very very little Chinese activity at the auctions, in Auckland it is the reverse. The Barfoots and Bayleys rooms are majority Chinese every week. Given that many of the Chinese buyers are incredibly young, you have got to suspect they are buying on behalf of others back in China. If they need money back for repaying financiers making margin calls or go into a general deleveraging mode as the Japanese did in the early 1990s (causing a down turn in our property market), then we again will see exactly the same thing here. Booms come and go. The current Auckland one may be crashed even though interest rates go to historic lows simply because when a $2m house rents for $1000pw, it makes little difference whether the interest rate is 4 or 7%, because either way it is costing a fortune each week in principle repayments as well as interest, so if capital gains are zero, there is no point to hold. Hence when enough people head for the exit at the same time then it is all over. In reality what will probably happen is that the peak will come off 10% (maybe more in some areas), and then prices will tread water for a few years. But bigger falls are possible. Awwww why is Remuera not part of the SHA? What's wrong with Little Rangitoto Reserve/Upland Rd Park, Waiata Reserve and Waiatarua Reserve, even Remuera Golf Course?? These are all potential SHA's surely?? These greenfields look very green to me!! we had a perfect plan called auckland unitary plan. There is no rocket science to this either - provide accomodation of all sorts-small apartments, big apartments, bigger apartments, small houses, big, bigger houses--whatever market asks for, in areas / suburbs people want to live in, close to city. Its called densification- thats the answer--not building houses 100 miles away from where people want to live- what a waste of resources. Look at any comparable city and see what they have done - youwill fing a lot of similarity to what was in our unitary plan. We listened to the Nimbys--a decision was made to densify a little and go out to greenfields a lot, albeit where no one would wants to live but at least we can build there with little resistance--what a mess. get someone in for some housing 101 - its still not too late. Is that idiot still dodging around the back paddocks with his little clip board. Sad. He now has a sidekick called Len. Who else is joining the team - Donald Trump? Its a circus - We know nothing is going to come of it.